"I have the answer to cancer, but American doctors won't listen. They come here and observe my methods and are impressed. Then they want to make a special deal so they can take it home and make a lot of money. I won't do it, so I'm blackballed in every country." ---Dr Budwig. You will come to your own conclusions as to why this simple effective prevention and therapy has not only been ignoredit has been suppressed! "Dr Willner, M.D., Ph.D. (The Cancer Solution). "Nobody seemed to notice that a crime has been committed: It was the case of the missing nutrient. The nutrient was essential; it was a nutrient we human beings needed in order to stay healthy. It started to disappear from our diet about 75 years ago and now is almost gone. Only about 20% of the amount needed for human health and well-being remains. The nutrient is a fatty acid so important and so little understood that I call it "the nutritional missing link"
we overheat them, destroying their protective, anti-mutagenic properties. ALL hydrogenated and partially hydrogenated products have also been overheated.."---Udo Erasmus (Fats That Heal, Fats That Kill). "Compared to 100 years ago, Omega 3 is down 80%, B vitamins are estimated to be down to about 50% of the daily requirement. Vitamin B6 consumption may be low as it is removed in grain milling and not replaced. Vitamins B1, B2, B3 and E have also been lost in food processing. Minerals are depleted in a similar way. Fibre is down 75-80%. Antinutrients have increased substantially---saturated fat, 100%; cholestrol, 50%; refined sugar nearly 1000%; salt up to 500%; and funny fat isomers nearly 1,000%. "Dr Rudin. HEALTH TIP: A remarkable alternative cancer treatment was devised by a German biochemist, Dr. Johanna Budwig, also a seven time Nobel nominee. Her most important medical contributions involved her research into the roles of essential fatty acids (EFAs). In order to mass produce and distribute foods high in oils, food manufacturers deliberately alter the chemical composition of the oils, which gives them longer shelf lives. In the 1950�s, she proved that these chemically-altered, hydrogenated fats (which she called �pseudo� fats) are rigid fats which stick to the cell membranes, thus causing them to malfunction. Dr. Budwig believed that these hydrogenated, processed fats and oils shut down the electrical field of the cells and make us susceptible to chronic and terminal diseases, since the beneficial oxidase ferments are destroyed by heating or boiling. She also demonstrated that the absence of essential unsaturated fats is responsible for the production of oxidase, which induces cancer growth and causes many other chronic disorders. She came to believe that cancer was not the result of too much cell growth, but defective cell growth (i.e., cell division), caused by the combination of too much �pseudo� fats and too few healthy fats in the cell membrane. But exactly what happens to fats when they are processed? In healthy fats there is a vital electron cloud which enables the fat to bind with oxygen. Healthy, oxygenated fats are capable of binding with protein and in the process become water-soluble. This water solubility is vital to all growth processes, cell damage restoration, cell renewal, brain and nerve functions, sensory nerve functions, and energy development. In fact, the entire basis of our energy production is based on lipid metabolism. Hydrogenation destroys the vital electron cloud and as a result, these �pseudo� fats can no longer bind with oxygen or with protein. These fats end up blocking circulation, damaging the heart, inhibiting cell renewal, and impeding the free flow of blood and lymph. You might want to remember this fact the next time you want to buy some margarine or fried foods, since both typically contain these harmful fats. Budwig understood that chronic disease is a result of a body lacking EFAs, which are full of electrons and bind to oxygen and proteins. When they are absorbed into the cell wall, they pull oxygen into the cell. And when bound to sulfur-based proteins, they become water-soluble. This is the theory behind the Budwig Diet: the use of oxygen in the organism can be stimulated by lipoproteins (sulfur-rich proteins and linoleic acid). 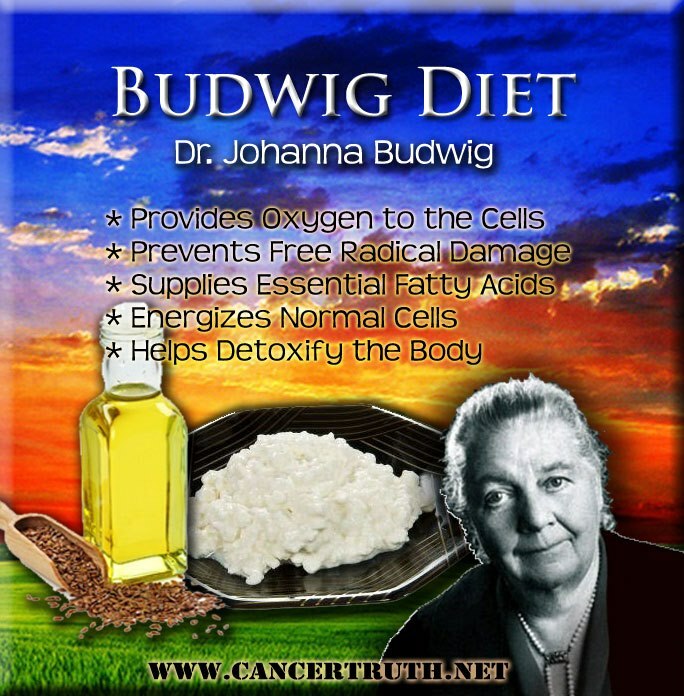 The Budwig Diet (a blend of flaxseed oil and cottage cheese) has been an integral part in the recovery of literally thousands of cancer patients. You simply mix one cup of organic cottage cheese with two to three tablespoons of flaxseed oil. Be sure to blend them together and let them sit for several minutes. This will convert the oil-soluble omega-3 into water-soluble omega-3. It is also a good idea to grind fresh flax seeds and add to the mixture. It is important to note that neither foods rich in EFAs nor sulfur-rich proteins alone will accomplish these tasks. This is because the oils must first bind to the proteins before oxygen can be bound and before the body can assimilate the combination. Thanks to the tireless work of Dr. Budwig we now know that electron-rich fats interact with sulfur-rich proteins to bind oxygen and promote aerobic metabolism which restores health.